Idly-Dosa chutney powder has a place in the kitchen of most south indian homes. It is basically a coarse powder of spices and lentils. This spicy and flavourful powder (or podi as we south indians call it) is a perfect side for idlies and dosas especially during lazy weekends. Steam the idly/dosa batter for 10 minutes and combine it with the idly/dosa powder and your healthy home made meal is ready. 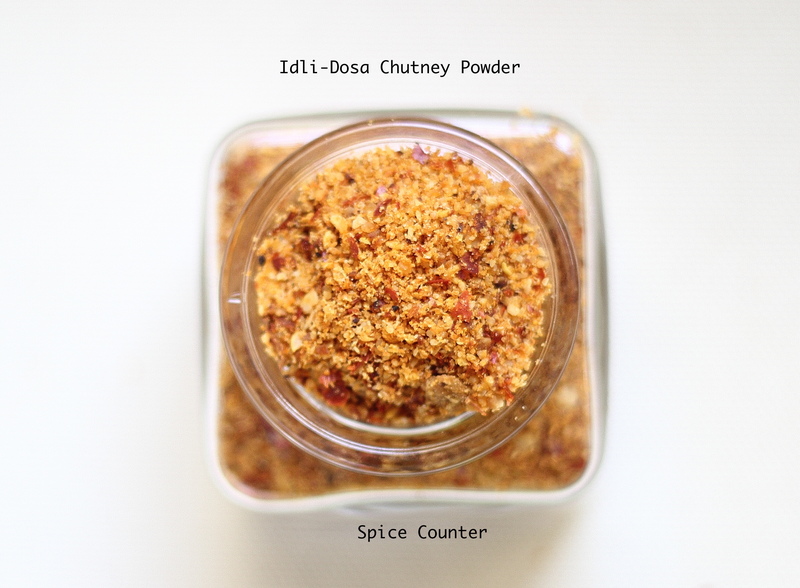 There are so many variations to the idly-dosa chutney powder. I have tried many versions but i like this one the best since i like the mild flavour that the garlic imparts. I learnt this method from a friend of mine. She uses raw garlic (which is actually very good) to make the chutney powder, however, i fried it for about 15 seconds before grinding it along with the other ingredients. Dry roast urad dal and sesame seeds separately till it changes colour. Transfer this to a plate. Add 1 teaspoon of oil to the pan and fry the garlic for 15 seconds. Transfer the garlic also to the plate. Now add the asafoetida and dried red chillies to pan and fry it till it becomes chillies bubbles up and becomes crisp. Once the ingredients are at room temperature, coarsely grind all the ingredients along with salt. The chutney powder is ready!